More weeds than expected in this canola field. –Slow establishment of canola plants, often due to dry conditions, which reduced crop competition and allowed later weed flushes to grow. –Wider rows and lower seeding rates that reduce crop competitiveness. –Low rates of herbicide and/or water that may have reduced herbicide efficacy. This may explain higher numbers of lamb’s quarters and redroot pigweed in InVigor canola, for example. –Weather conditions during or shortly after herbicide application can impact herbicide efficacy. For example, warm conditions can reduce herbicide uptake, resulting in reduced weed control. 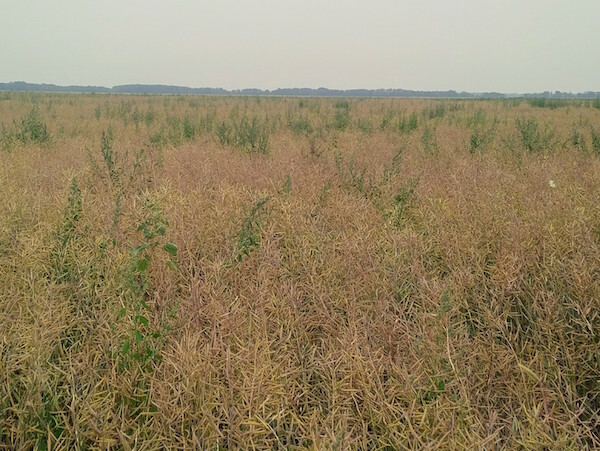 –Kochia escapes in Roundup Ready canola could be glyphosate tolerant. Glyphosate-tolerant kochia is found in all three Prairie provinces. If patches of kochia are small and suspicious, hand roguing** can be a highly effective management option as long as seed drop has not begun. Any large weeds allowed to mature can greatly increase the weed-seed bank as each plant will often have 10,000 seeds or more. A pre-harvest herbicide application may be required if weedy fields will be straight combined. This will dry down big green weeds. It may also reduce seed set – but this may have limited practical benefit if a large percentage of seeds are already mature. If going with this option, go big: Use the highest approved rate and pay attention to label requirements for crop staging. Note that fields with variable crop staging may be inappropriate for pre-harvest herbicide because glyphosate cannot be sprayed on seeds with more than 30% moisture. Swathing may be the only weed management option for those fields. Swathing will also stop these weeds (though, as noted, will not prevent already mature seeds from adding to the seedbank). Swathing can provide an immediate solution if seeds are immature. Post-harvest weed control for perennials and winter annuals will be recommended, especially if harvest is early. **If roguing out kochia patches, you could stuff them into mylar seed bags or big pillow cases (tight weave) and hang them in a breezeway to mature, then send seed to Saskatchewan’s Crop Protection Lab or to Charles Geddes at AAFC Lethbridge. Geddes is taking over the monitoring of glyphosate- and dicamba/fluroxypyr-resistant kochia testing. Testing will be conducted free of charge by AAFC for these two situations as well as any herbicide resistance that is not already documented in Table 10 on page 50 of the Saskatchewan and Manitoba Guides to Crop Protection. Testing is free and grower identification will remain confidential. The Prairie-Wide Herbicide-Resistance Diagnostic Testing Sample Submission Form describes the procedure used for sampling, packaging, shipping and testing the kochia plants.